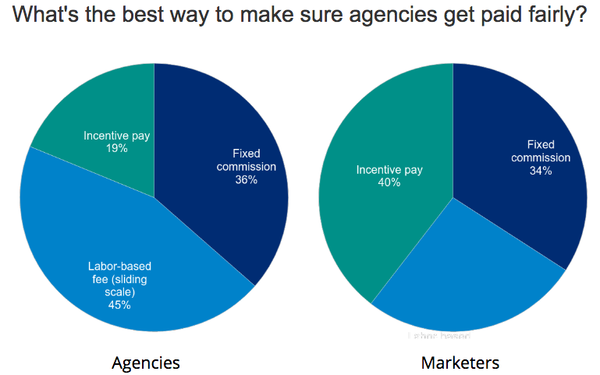 Agencies and their clients are far apart in terms of what they deem to be the most fair method of compensation, according to findings of a survey of advertiser and agency execs conducted recently by Advertiser Perceptions for MediaPost. While labor-based fees are the No. 1 method preferred by agencies (45%), incentive methods were the top choice among marketers (40%). Interestingly, after years of erosion, fixed media commissions are once again becoming a popular method of agency compensation, and were cited as the fairest method by about a third of agencies (36%) and clients (34%). The survey was conducted following the release of a member survey by the Association of National Advertisers, which also found that commissions are making a comeback among its members. The Advertiser Perceptions findings are based on a survey of 310 ad executives -- 60% agency, 40% marketer -- conducted in June.